Washington (AFP) - The New England Patriots presented US President Donald Trump with a commemorative Super Bowl ring following the team's visit to the White House earlier this year, USA Today reported Tuesday. Patriots owner Robert Kraft -- a friend of Trump -- gave the US leader one of the diamond-encrusted rings in recognition of the team's treatment. USA Today reported that Kraft also decided to offer the ring as New England was the first professional sports team to visit under the Trump administration. The Patriots visited the White House after pulling off the greatest comeback in Super Bowl history to defeat the Atlanta Falcons in February. 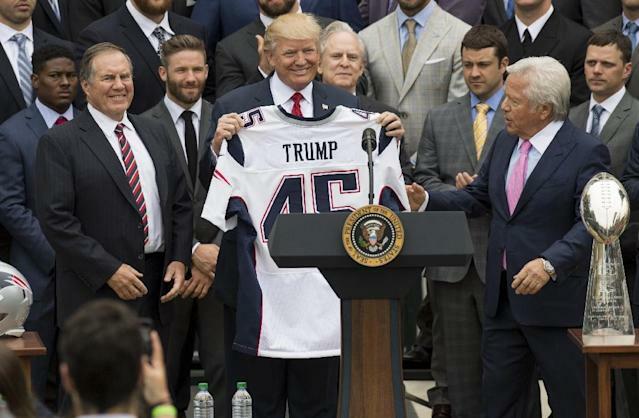 A spokesman for the Patriots told USA Today the team had been impressed at their treatment during the reception, which included more time with the President and a more extensive tour of the White House than on previous visits. The NFL covers costs of between $5,000-$7,000 each for 150 Super Bowl rings, with any additional costs being covered by the team. No price tag for the 2017 Super Bowl rings has been released but in 2015 Kraft spent an estimated $36,500 on each ring for his team which featured 200 diamonds each. Each of the 2017 rings comprised 280 diamonds set in 10-karat white gold. Trump however may not be allowed to keep the ring -- strict rules limiting the value of gifts accepted by presidents almost certainly mean the ring will end up in the National Archives. The Patriots spokesman said the team believed the ring could feature in Trump's Presidential Library once his presidency ended.